...That's What She Said: Call of Duty: World at War Zombies Now with Shi No Numa! 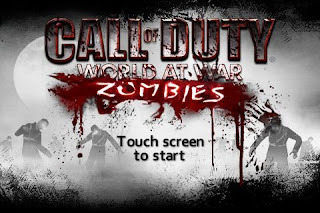 Call of Duty: World at War Zombies Now with Shi No Numa! Well, not NOW now, but soon. That's right boys and girls. They are in fact going to release Shi No Numa for the iPhone/iTouch app. I know a lot of people have asked about this map and would it ever be released. Well, the answer is yes! I don't have a date for which the map will be released but I do know that it will be. I also cannot tell you for sure if it will be released for the iPad, so, I'll go the safe route and just say that I know it will for the iPhone and iTouch. It looks to be a great map. Hope this makes you all as happy as it makes me. I know I'll be getting it once it becomes available! EDIT: The map will be sold as both a standalone app or an additional map like Verruckt. Oh, and there's gonna be hellhounds in there too!